A few days after it was bottled my artisan gin still looks a little cloudy. Nothing like the pure commercial gins you find in your local liquor store. Fortunately, it tastes delicious, with citrusy​ notes and just a hint of of chilli. Which was exactly what I was aiming for when I blended and distilled​ it. 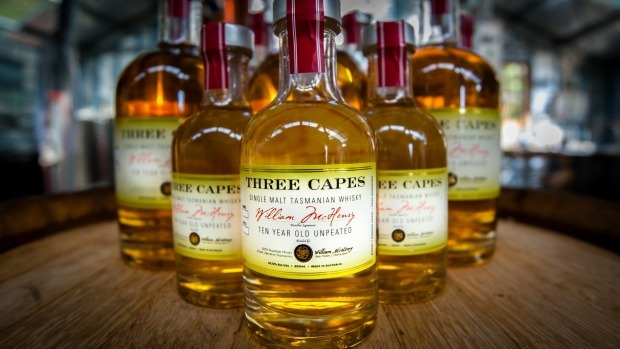 Even more pleasingly, it has received the tick of approval from Bill McHenry, one of a growing number of craft distillers in Tasmania. To be fair, this was my second attempt at distilling a gin. The first, earlier in the day, ended up in a "boilover" when I let my blend become too hot and it bubbled away a little too merrily. Second time around I appear to have got things just right. 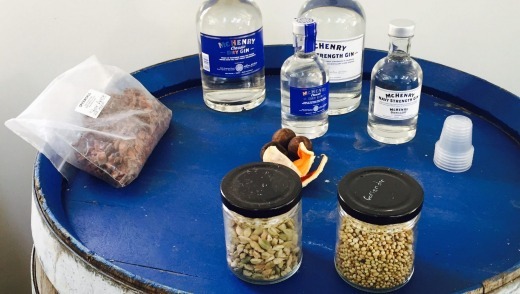 McHenry started out by making whisky (a popular pastime in Tasmania), but has diversified into gins and vodkas which have found their way to the top shelves of some of Australia's leading hotels and restaurants. In collaboration with Kim Dudson, who runs Bespoke Tasmania Tours, he recently launched Bespoke Gin Tours, which take participants through the history and culture of gin before placing them in the role of distiller. "We think it is a fascinating process," he says. "Hopefully people will be engaged with what we do and leave with a greater understanding." Turn the clock back 10 years and Bill McHenry was a very stressed high-flyer in the pharmaceuticals industry. He had an epiphany when he drove through a red light in busy Sydney traffic one day, so engrossed in his business issues that he had completely forgotten what he was doing. "I didn't hit anyone but it shocked me what I had done," he said. "I went back home and decided on big change. 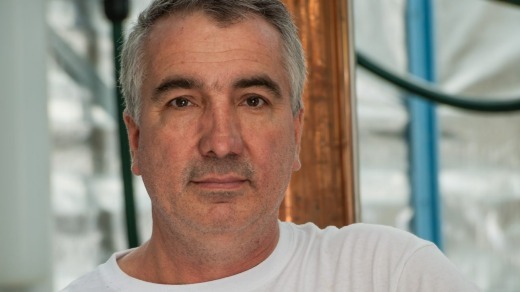 I wanted my own business and I've got Scottish heritage so distilling seemed a natural fit." These days McHenry and his family are very much at home in slow-paced Tasmania. The distillery is situated on 100 pristine acres on the Tasman Peninsula, just outside Port Arthur "and it has its own natural springs – and pure water is essential for distilling". McHenry delights in showing guests (and would-be distillers) around his rustic property, which is teeming with wildlife. Back in the distillery, our small group, ferried from Hobart that morning by Bespoke Tasmania (with a couple of stops along the way) learns that gin is created by filling a pot still with neutral spirit diluted to 45-60 per cent and that juniper berries and other botanicals are added according to taste. Each of the participants is equipped with their own mini pot still and they can choose from around 30 different botanicals depending on what flavours they are looking for in their gin. We learn the differences between London gins, Navy-strength gins and sloe gins (made with sloe berries). I choose juniper berries, an essential ingredient of quality gin, orange peel, lime, chilli, star anise and cardamom as my key flavour drivers. We learn about the distilling process, how gin was developed on the basis of the Dutch drink jenever and became popular in Britain when it was ruled by William of Orange, leader of the Dutch Republic. We discover gin was used in tropical British colonies to mask the bitter flavour of quinine, which was the only effective anti-malarial compound. We taste several styles of gin, enjoy a tour of the distillery, and then enjoy a gin-matched lunch prepared from local ingredients by Bespoke Tasmania and savoured high on a hill on the property with views to the ocean. While our creations are bubbling away we get to grill Bill on the many facets of distilling and learn that these workshops are the only ones in Australia, and, possibly, the world. We later learn how to adjust alcohol levels by adding that pure spring water. The four hours pass surprisingly quickly and we feel like gin gurus by the end. All guests leave with a 400ml bottle of their own creation to enjoy at their leisure, and a 200ml bottle of William McHenry London Dry Gin with which to compare it. According to Bill, my gin is "pure, tasty and elegant". Apparently I could filter my gin to remove the cloudiness, but I'm happy. The gin experience can be further enhanced by taking your bottle to the Henry Jones Art Hotel, where the bar staff will use your gin to make a special cocktail. This costs $10 – but is free for in-house guests. As the tours are only offered through Bespoke Tasmania, guests can structure the rest of the day at their own pace and to their own inclinations. We stopped at the Port Arthur Lavender Farm for a tour and coffee; and then at Bangor Wine and Oyster Shed on our way back to Hobart to sample some freshly shucked​ local oysters. The worldly and knowledgeable Dudson, who runs official tours for MONA and the Henry Jones, says tours can be tailored to all interests, including to privately-owned rare colonial buildings, gardens, craft breweries, wineries or art galleries. Virgin Australia, Qantas, Jetstar and Tiger Airways all fly to Hobart from Australian capital cities. Bespoke Gin Workshops are held at William McHenry & Sons Distillery at Port Arthur, with tours lasting four hours including lunch and gins to take away. Prices start at $225 per person using a shared still. The writer was a guest of Bespoke Tasmania and William McHenry.